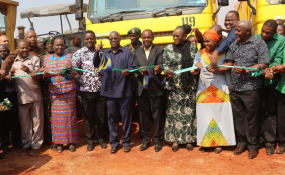 President John Magufuli with Minister for Works, Transport and Communications, Prof Makame Mbarawa (fifth left); First Lady, Janeth (third right); Minister for Education, Science and Technology and Vocational Training, Prof Joyce Ndalichako (second left) and other government officials as launched the construction of a tarmac road from Nyakanazi in Biharamulo District to Kakonko in Kigoma Region. Whether his moves in the mining sector work or not, President Magufuli knows what he is doing. Ever since his election in 2015, Tanzania's President John Magufuli has been a subject of public fascination. At first, his war on graft promised to cleanse the state of corruption, while his patriotic thrift inspired the hashtag #WhatWouldMagufuliDo? But as this campaign of tumbua majipu ("lance the boils") was becoming old news, Magufuli became associated with another d-word. To "development" was added "dictatorship". Public rallies were banned, radio stations shut down, and newspapers publicly threatened. It became apparent that Tanzania was taking a sharp authoritarian turn. Now, Magufuli's image is shape-shifting once again. Over a matter of days earlier this month, the president turned Tanzania's mining policy on its head. A regime of low taxes, free enterprise and light-touch regulation ended at the stroke of a pen. Magufuli assumed a new identity: the president that took on the multinationals. The changes began in earnest on 3 March, when Magufuli imposed a ban on exporting unprocessed mineral ores. Containers holding copper-gold concentrates began to gather in the port of Dar es Salaam. On 29 March, Magufuli appointed a committee to chemically examine the contents of the containers, which belonged to Acacia Mining, a subsidiary of Barrick Gold. That committee claimed that the containers held more than 14 times the quantity of gold Acacia had reported. They concluded that the company had been trying to swindle the government, and had probably been doing so for years. A series of estimates were circulated about how much Tanzania might have lost over the years. Acacia Mining flatly denies the allegations and insists the Tanzanian government routinely samples containers at the mine site. Others suggest that customs checks are lax and trust the Office of the President more than a foreign company. Either way, the government's alleged proof of Acacia's underreporting has been used as a pretext for action. Earlier this month, the National Assembly passed three bills which effectively overhaul Tanzania's mining policy regime. The royalty rate on gold is raised from 4% to 6%. The government is entitled to a 16% share of mining companies stock without compensation, and empowered to purchase a further 34%. The regulation banning the exportation of concentrates and unprocessed minerals now has the permanence of an act of law , and 1% clearing fee is to be levied on mineral exports. Magufuli's austerity and intolerance for corruption were popularly interpreted as a departure from the clientelism and expanding government spending popularly associated with Jakaya Kikwete, his immediate predecessor. But if the first act of Magufuli's presidency represented a break from Kikwete, the next signifies a break with former presidents Ali Hassan Mwinyi and Benjamin Mkapa. It was Mwinyi who presided over the liberalisation of the economy and privatisations of the early 1990s. And it was Mkapa and the World Bank that drew up the 1998 Mining Act, which established the policy framework that governed Tanzania until two weeks ago. That law not only introduced a gold royalty rate of 3% and a smooth license application process. It also created the most controversial aspect of Tanzania's mining policy: development agreements. These contracts, negotiated between mining companies and the government, were almost never made public. They typically included reduced royalty rates, tax exemptions, and legal assurances that mines would be safe from government interference and seizure. Magafuli's new legislation explicitly write development agreements out of Tanzanian law. This move not only tears up contracts with mining companies, but also tears up the consensus on mining policy within the ruling party. Speaking at a public rally two week ago, Magufuli complained: "We privatised even strategic institutions like the railways corporation. It's like we decided to leave each and everything to investors, which was wrong." The passage of these recent acts will not close the issue. Tanzania wants foreign investment just as mining companies want the favour of government. Magufuli compromises when he needs to. He settled a dispute with Dangote in 2016, and it is likely that he will amend recent changes to mining if he needs to. But until recently, mining companies seemed determined to slow down reforms at every turn. The president's legislative spree makes clear that the government is not to be trifled with. His actions are as much pre-negotiation tactics as they are about unilaterally creating a new mining regime. Below the surface, Magufuli's changes are also about party politics. The president's approval ratings stood at 71% this June, down from 96% a year ago, though part of the difference may be down to survey question wording and methodology. These ratings might still seem sky high, but a combination of social desirability bias and civic duty make Tanzanians almost always answer in the affirmative to questions about presidential approval. By Tanzanian standards, 71% is poor. In fact, it is the worst rate any Tanzanian president has ever received. The public trusts the ruling CCM over the opposition on almost every area of government. But for a decade, natural resource governance has been a rare issue on which the opposition is strong and on the right side of opinion. In 2007, opposition party Chadema launched a public opinion and party-building exercise called Operation Sangara. Sangara (meaning "Nile perch") was used as symbol both for CCM's "big fish" preying on ordinary Tanzanians, and for the nation's natural wealth that CCM was colluding with foreign business to plunder. Chadema took this message to the regions that encircle Lake Victoria, which are also home to Tanzanian's largest gold mines. In the 2010 elections, they made gains across the Lake Zone. Typically, the more that CCM has tried to play catch-up on mining policy, the happier the opposition has been. For example, when Kikwete established the Bomani Commission to recommend changes to mining policy and extracted concessions from the mining companies, the opposition jeered. They denounced the compromises, cheap talk and close relationships between CCM and business. They are still pressing the issue particularly hard against Kikwete, who presided over several of the first licenses for Tanzania's largest mines while Minister for Water and Energy from 1990 to 1994. Magufuli's foray into mining policy differs from those of his predecessors. While Mkapa and Kikwete favoured incentives and negotiation, Magufuli favours action and theatrics. It was no accident that Magufuli declared that "the world is currently fighting an economic war". He is putting clear water between himself and the mining companies, and stealing the opposition's clothes in the process. If anyone still doubted that parties compete over issue ownership in Tanzania, they should think again. By picking a fight with multinational companies, Magufuli is intentionally stirring popular memories of Tanzania's first president, Julius Nyerere. In Tanzania, political morality is understood in terms of finding one's way back to Nyerere. By espousing the language of sovereignty and economic war, Magufuli is tapping into political memories of liberation struggle and revolution. While Magufuli is marking a break from his predecessors, he is still invoking a romanticised idea of the past. The events of two weeks ago amount to a radical overhaul of Tanzanian mining policy, but also a masterclass in political manoeuvring. This is not to cast aspersions about the sincerity of Magufuli's intentions to reform the mining sector, but to illustrate that those reforms serves several purposes at once. Magufuli's critics often accuse him of impulsiveness. In May this year, The Economist wrote that "he has a worrying tendency not to think things through". But whatever one thinks of the merits of pressing the mining companies hard, all signs suggest that Magufuli is in fact thinking hard, and not only about the economic but the political too.